And 404 is the familiar "not found" response. Cool. I had finished reading that at 11:40am. I can use restSetResponse() for the DELETE method because my returntype is void. 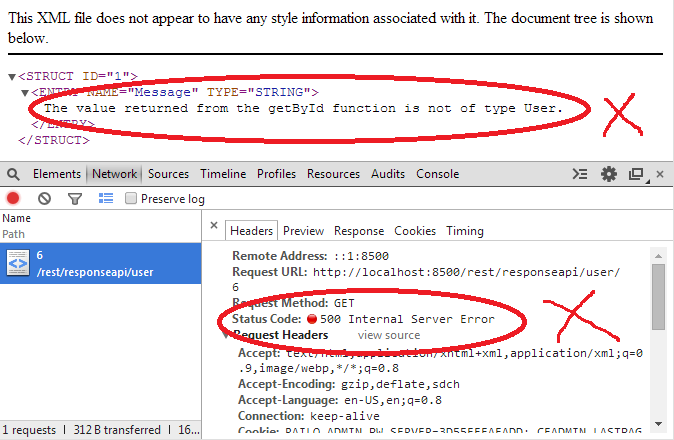 Which is a restriction of restSetResponse() (not in the docs, but in this DevNet article: "Getting started with RESTful web services in ColdFusion"). But what about my GET method? As noted in the comment... nuh-uh. I cannot do this. It doesn't see fit to pay attention to the response code I asked for, it just follows its own stupid internal rules and goes "nup, you can't do that! I have rules you know!". However I think this finally demonstrates that this rule that restSetResponse() can only work on void functions is just... wrong. There is a very good use case where it needs to work on functions which quite legitimately return something in most situations, but one needs to use restSetResponse() in abnormal situations. Well a 404 isn't even a very "abnormal" situation. RestSetResponse is not like return statement. RestSetResponse does not actually return anything. It just sets the custom response, which ColdFusion gets and sends the response. In ColdFusion, cffunctions should adhere to the return type. If you have specified a return type, you should return some value of that type. 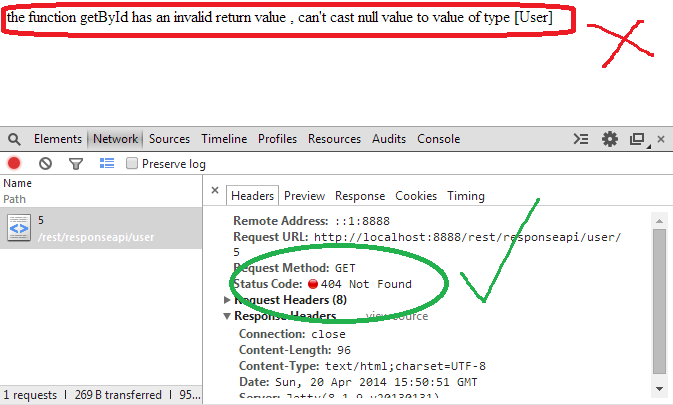 The value returned from the conditionallyReturnArray function is not of type array. Or some variation on that theme. Railo behaves much the same, except one can also return null from a numeric function too, and it doesn't error. So the problem here really is not with restSetResponse(), I suppose. The problem is that there's this bung rule in CFML that one cannot return null from a function that expects to return an object type. And this is wrong. However that's a bit more of an architectural change than Adobe are gonna want to do. Even if they alter the rules for REST services wherein the response can quite legitimately take the form of [some data in the response], or just some headers. CFML REST services need to respect this. On the other hand... I need to get this stuff working. Anyone know a way of being able to write REST services so they are capable of making a correct response for both happy and unhappy paths? Someone else must've worked around this? Oh... why was I deliberately giving you the times at which I completed various steps of this investigation? Because I decided to write this blog article at midday. It's now 6pm and I've been writing for about an hour. All the time from 12pm - 5pm was simply trying to coerce ColdFusion into actually running this RESTful CFC. It works fine in Railo and took less than an hour to write. To convert it to something ColdFusion would work reliably with took almost 5hrs. The obvious syntax changes took about half an hour to iron out (to get to a point where the could would even compile on ColdFusion 10), the rest of the time was spent going "WTF?"... "FFS, will you work?"... "Oh for goodness sake, what's wrong now?"... "Oh... you need it to be like that do you?"... "um... OK, I'll restart ColdFusion entirely then to see if that helps" (sometimes yes, sometimes no, btw), "but that's just... wrong". Four hours of that. And reading on StackOverflow (because the Adobe docs are a waste of frickin' space) hoping someone else had seen a given error message (generally: no). The ColdFusion REST implementation has had a bit of a bad rap in this regard, I know. One thing I can say is that it's not a syntactical issue, it's just a bad implementation. Railo is far more stable, doesn't have any unexpected idiosyncracies, and - as long as yer code is syntactically correct - just works (without restarts or reboots too, I hasten to add). I really wonder how Adobe managed to make such a pig's ear of this stuff. All I was hoping to do today was to do that backbone.js tutorial. I guess I should simply have stuck with the working code in Railo and got on with it, rather than trying to get this code working in CF so I can blog about it. My bad. But now I've been completely sapped of the will to live, so I'm going to grab a glass of wine and be done with it. I might document the shortfalls I encountered with CF's REST implementation tomorrow. But... I'm not sure I can be arsed. I will follow-up the CF bug and observe that not being able to use restSetResponse() on methods which aren't void is not a starter, and something needs to be done there.